Jewish Home head slams 'lies' uttered by EU parliament head Martin Schulz from Knesset podium, says he expects an apology. 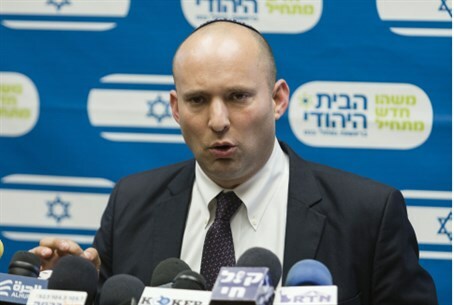 Economics Minister and Jewish Home party chief Naftali Bennett has called on the head of the EU Parliament, Martin Schulz, to retract the "anti-Israel" statements he made today in an address to the Knesset and issue an apology. "Criticism, yes - lies, no," Bennett wrote on his Facebook page Wednesday, following the storm which erupted as Jewish Home MKs walked out of Schulz's speech from the Knesset podium. Schulz had incensed legislators and was accused of repeating anti-Israel lies when he accused Israel of discriminating against Palestinian Arabs in Judea and Samaria when allocating water resources. "I sat in the Knesset hall and listened attentively to the European Parliament Chairman's speech... he expressed friendship towards Israel and pain and empathy regarding the holocaust and the past," he said of Schulz, who is German. "I expected him to criticize Israel on its policies relating to the '67 lines, and that he would call for the establishment of a Palestinian state," Bennett continued, and added that that would have been acceptable. "And then, a second statement: 'Israel is imposing a siege on Gaza', as if we didn't leave Gaza, expel 8,000 residents, destroyed communities, and as if they didn't fire thousands of rockets at the citizens of Israel." "I am completely prepared to hear criticism from friends. I am not prepared to remain silent in the face of lies. That is why I left together with my party from the plenum. "I'm hoping we'll hear an apology for those statements." Other Jewish Home MKs also reacted angrily to Schulz's words, including MK Moti Yogev, who heckled him during his speech, saying the EU parliamentary head had "chutzpah" for "supporting the Palestinians who are inciting to destroy Israel, 70 years after the Holocaust." Jewish Home MK Orit Struk also said her party's representatives felt they had no choice but to walk out. "When the President of the European Parliament spits on you, you cannot just remain silent, wipe your face and call it rain. It is unprecedented gall to stand up in the Knesset of Israel and proceed to slander the entire body of elected officials and the entire Jewish People - in German!" she fumed. But MK Nitzan Horowitz of the far-left Meretz party was quick to defend Schulz, and said that if anything, he had been "too polite". He accused right-wing MKs of opposing Schulz simply because he called for peace, and said that Israel was "strangling the Palestinian population."